The first ever Timbers field was built by the BERNHARDT GOLF back in 1981 at Catlin Gable School. So it only made sense to approach them when it came time for the MLS Timbers to install our practice fields at our training facility in 2011. Since then, the Portland Timbers have used Darryl and his team at BERNHARDT GOLF to install two grass practice pitchs and the base and drainage for a state of the art Fieldturf pitch. All three of our surfaces have received high marks from our players and our coaching staff. I will even go as far and say that some of our players tell me that our grass practice pitch is better than most of the game fields they play on. Darryl’s attention to detail, ability to keep the project on time and on budget is only surpassed by the quality of his finished product. BERNHARDT GOLF truly cares that they do what they say they will do and it shows in their commitment before, during and after the project is complete. I would strongly recommend BERNHARDT GOLF for any project large or small. I had many occasions to follow the work of BERNHARDT GOLF during my 30+ years at OSU as the State Turf Specialist. I was always impressed with their innovative approach to grading, drainage, and golf course and athletic field construction. They have a knack for completing projects on schedule and on budget. Their projects are always simply done and they work the first time. Their common sense approach to their work and their ability to get projects done when others cannot, it makes them stand out in the crowd. In my 30 plus years experience in the golf course industry BERNHARDT GOLF is by far the best contractor I have ever worked with. Our remodel project was under a very tight time line of 60 days. BERNHARDT GOLF guaranteed us that they could complete the project on time. Not only did they keep their commitment, they completed our project in less than 40 days which resulted in the golf course reopening on time. Darryl is the most organized contractor that I have ever had the pleasure to work with and the quality of work is outstanding. When there was a design issue Darryl was able to identify it before it became a construction issue and we were able to make the necessary changes which resulted in savings for the golf course. Our remodel project was a huge success thanks to BERNHARDT GOLF. R. D. Pete Petersen Jr.
Widgi Creek Golf Club resurfaced seven greens in the spring of 2009. We used BERNHARDT GOLF to help with this process. I chose BERNHARDT GOLF because of the 45 years of experience they have and the extensive resume in construction and renovation projects with many other golf clubs in the Northwest. They are very easy to work with, make the project go smoothly and do a quality job. They know the quality a Superintendent wants and understand the pressure of getting the project completed in a timely manner. I would use BERNHARDT GOLF again and recommend them to anyone. I have been very pleased with the quality of BERNHARDT GOLF's work on the four field softball/baseball complex at SE 162nd Avenue Park in Happy Valley. Every step of the way, they were well organized and not only finished the project on time, but ahead of schedule. Considering the complex nature of this project, and the weather sensitive work that needed to be completed over a wet winter, they did an amazing job in finding a way to get the job done. I hope we get the chance to work with Darryl Bernhardt and BERNHARDT GOLF in the future. When choosing a contractor for our course renovation we wanted a company with regional knowledge of our environment, expertise in golf courses, and the ability to complete the job in a timely manner and within budget. We found that with BERNHARDT GOLF. On the recommendation of Dr. Tom Cook, turf guru (retired) at OSU we hired BERNHARDT GOLF to re-sod the goal areas on Merlo Field (our varsity soccer game field) during the short interval between the end of the regular season and the subsequent playoffs we seem to enjoy. The sod was thick-cut from off the play-area and successfully installed to withstand the aggressive post-season play. 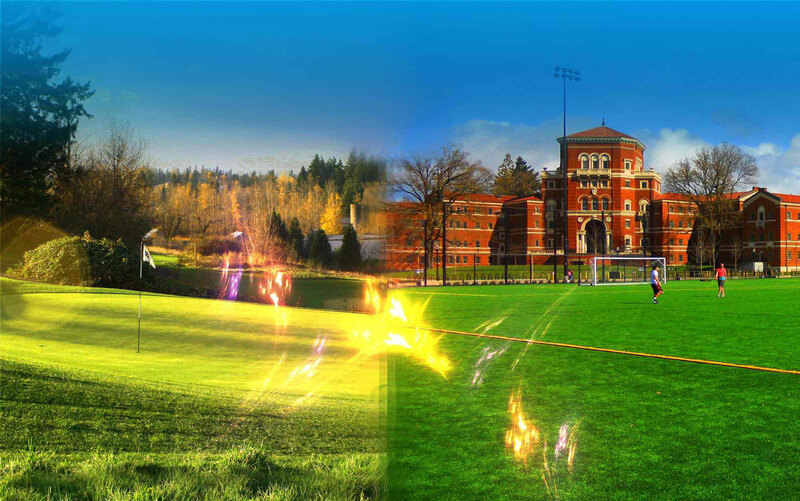 Then 2 years ago we asked BERNHARDT GOLF to build a state-of-the-art soccer practice facility for us here at the University of Portland. This included an artificial-turf (FieldTurf™) field and an adjacent sand-base real turf field. It was evident from the start these were going to be quality installations when I met the Bernhardt crew and saw the heavy equipment arrive. I have too often seen jobs like this done where the contractor tries to make do with inadequate equipment and crew, resulting in compromises. This was not the case with BERNHARDT GOLF. The work included major excavation, installation of a drain system with drywells, and a complete state-of-the-art irrigation system. The field was seeded with an Oregon grown Perennial rye-grass blend. Even after the handover of this "turn-key" operation they continued to assist me in the early maintenance phase to insure the field would remain a first-class product. The following year our baseball facility (Joe Etzel Field) needed a major re-grading of the infield (after years of top-dressing the skinned area left 1st base 6 inches higher than home plate) so it was a no-brainer to use BERNHARDT GOLF for this project also. After removal of over 40 yards of material, laser-grading, upgrading the irrigation system and sodding, the field was ready for the following spring season. This was all done while leaving the outfield intact. You'd be hard-pressed to find a company with a more professional approach or more knowledgeable crew. BERNHARDT GOLF has provided irrigation construction for several of my client's projects for many years. Without exception, their work has been performed professionally, in a timely manner, and their prices have been very competitive. BERNHARDT GOLF came to me highly recommended and I gladly pass that recommendation on. BERNHARDT GOLF has worked at Tualatin Country Club for many years. They can always be counted on for quality work and dependable service. Scheduling any construction work is always a challenge; however, BERNHARDT GOLF has always come up with ways to fit projects in around tournaments and member functions. I have always appreciated the way they can complete projects quickly and efficiently without sacrificing quality. A good contractor will complete a project on time and budget. A great contractor offers practical experience and an understanding of client priorities to bring greater value to a project through design innovation, opportunities for cost savings, and an allowance for change while still meeting schedule and budget. BERNHARDT GOLF has proven to be a great contractor.